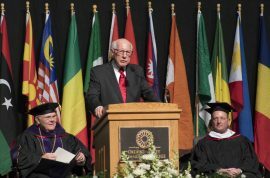 Oklahoma City businessman Gene Rainbolt delivers the keynote address at the 2018 OCCC Commencement Ceremony. Students at Oklahoma City Community College are eligible to be placed on the Vice President’s Honor Roll in any fall or spring semester in which they have attained a semester grade point average of at least 3.5 while carrying 12 credit hours or more of college-level courses. Part-time students are also eligible if they have maintained at least a 3.5 GPA during two consecutive semesters while enrolled in six credit hours or more of college-level courses each semester.